When discussing matters with the other person’s insurance company, avoid anything that could indicate fault on your part. Apologies may seem like second nature, but they have no place in insurance company discussions. Did you suffer painful symptoms prior to your car accident? It’s tempting to minimize previous suffering or withhold this information altogether to obtain more extensive damages, but your damages could be diminished or wiped out altogether if you’re caught in a lie. Don’t underestimate insurers’ access to relevant information. Whether intentional or not, many car accident victims tend to either exaggerate or downplay their symptoms. Exaggeration is clearly problematic in that, if caught in a lie, you could face significant repercussions. With downplayed injuries, you’re less likely to suffer recourse from your insurer… but you’re also less likely to obtain the full damages you deserve. Two of the worst words you can recite to an insurance adjuster: “I’m fine”. Prompt settlements are not always bad news, but if you feel rushed, there’s probably reason for concern. Your insurer may claim to be “helping you” by seeking a quick resolution, but this approach may lead you to accept reduced damages. Quality representation could make all the difference in the aftermath of your McKinney car accident. 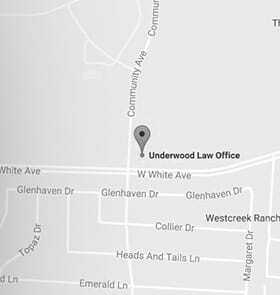 When you work with the Underwood Law Office, you’ll receive the exceptional service you deserve. Call 972-535-6377 to schedule a case consultation. Click what to do after an accident for more information.